Polystorm Lite has all the same attributes of Polystorm capable of accomodating the majority of site constraints. The difference is Polystorm Lite has been specifically designed for non-trafficked applications. With a 20 tonne per square metre compressive strength it will however take general maintenance vehicles such as grass cutters. Attenuation solutions can be designed and built using Polystorm Lite as a modular construction to form tank structures. The modular structure receives rainwater collected from roofs or surface drains ready to release within a set drainage limit. Polystorm Lite can be fully integrated with our Stormcheck flow control chamber and silt traps and is typically used for landscaped areas, pedestrian or public open spaces such as underneath playgrounds. 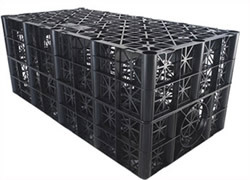 95% void ratio allowing greater storage and reduced excavation and disposal cost. Cells are light enough to carry providing health and safety benefits. Flexibility in design and shape would also be ideal for shallow excavation. Fully compatible with Polypipe Civils drainage product range. * Each unit includes A clips and 2 shear connectors. *** in weak clay maximum burial depth should not exceed 1.5 meters. Do not install Polystorm Lite below water table. For installations deeper than the recommended 2 meters please contact Polypipe Civils Technical Team.